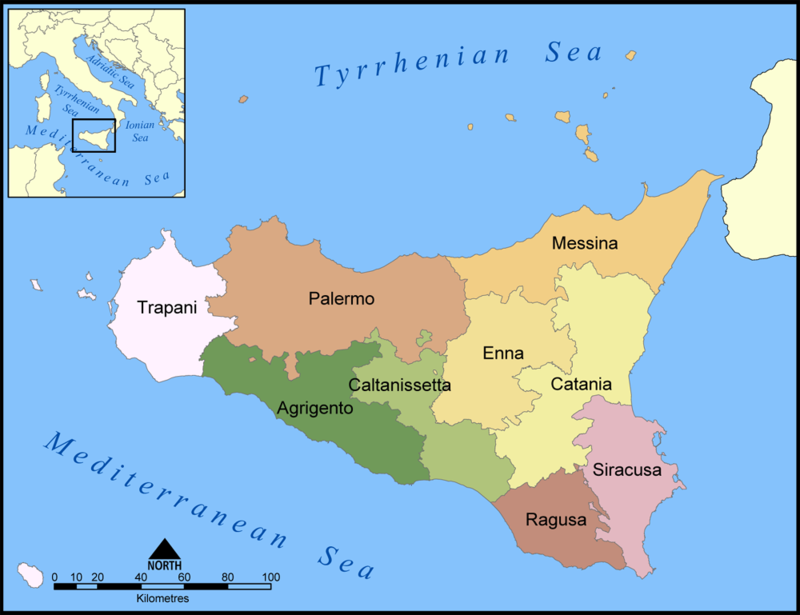 On the western coast of Sicily, the province of Trapani gets its name from the word for “hook” in several languages, due to the large curving land which is its dominant geographic feature. In the 8th century BC, the Phoenicians, the first serious seafarers in the world, discovered Trapani and made it a trade center. The Carthiginians made Trapani into an important naval base. Long before the Phoenicians arrived, a primitive settlement called Drepano (which means sickle, also referring to the curve of land into the bay), was in the area where modern Trapani sits. Evidence through the province suggests early human settlements dating to the Paleolithic era. Cave paintings and other archaelogical evidence point to the presence of Homo Sapiens. During the Punic Wars, the Carthaginians lost Drepanum, as it was known at the time, to the Romans (241 BC). In the 9th century, the Arabs gained control of the city of Trapani, and in the 11th, it passed to the Normans. They elevated Trapani to the status of royal city and ushered in a time of great commercial development and prosperity. Sea salt is one of the most well-known products of Trapani.. The Phoenicians built windmills which drew water into a series of successively smaller ponds until the water had all evaporated and all that remained was a pile of salt. The salt was raked and covered, then allowed to sit on the beaches until it was sold. The major route from Trapani to Palermo is still called the “Salt Road.” That method is still used today, resulting in some of the best sea salt in the world. The town of Marsala, home of Marsala wine, is also within the province of Trapani. This fortified wine, created in 1796 by the Englishman who created port in Portugal, is primarily thought of as a dessert wine or ingredient; it is essential to Zabaglione. The growers are investing in greater technology for growing grapes and making the wine, which has resulted in wines that have recently risen to new heights of quality and critical acclaim. Almonds are another major crop of the province of Trapani; Sicilians as a whole are passionate about almonds and the island is one of the world’s greatest producers of fine almonds. Trapanese pesto, an intense blend of tomatoes and basil, uses almonds rather than the pine nuts found in the classic Ligurian version. Tuna and other fish are very important to the commerce of Trapani; small ports and fishing villages abound through the province. A visit to Trapani must include a stop at a city fish market! Like Palermo, Trapani has much beautiful architecture: churches, cathedrals, ancient temples and more. The Annunziata Sanctuary (’Our Lady of Trapani”), built in the 14th century, had to be entirely rebuilt in 1760. A mix of Arabic and Catalan styles, the Sanctuary also contains the Fisherman's Chapel. The Castle of the Earl of Modica, another 14th century masterpiece in the Gothic style, is in the town of Alcamo. Still in the province of Trapani but close to the city of Agrigento are the ruins of Selinunte, an ancient Greek city which was destryoed around 400 BC. During its heyday, it was one of the most well-known cities in the Greek world and has ruins that are almost equal to those in the Valley of the Temples. Off the coast near Marsala, the island of Mozia, home to ancient Phoenecians, features a museum, as well as magnificent ruins of the advanced civilization that lived there until 379 BC. Gourmet food lovers should check out the Salt Museum (Museo del Sale) in Nubia.